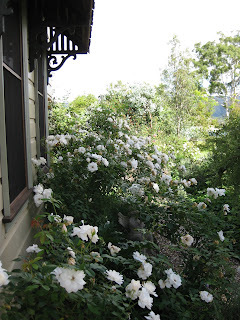 Kurrajong garden: Early Autumn, what a joy . . . Early Autumn, what a joy . . . The nights are starting to cool down at last. This morning is so clear and fresh that I feel really inspired to get out in the garden as quick as I can, even if it is just to pull out weeds! My walking friend called round one afternoon last week, to see if I wanted to go for a walk. Well, she walks, I hobble. While I got my shoes on, she wandered along the path at the front of the house to the roses on the western side. 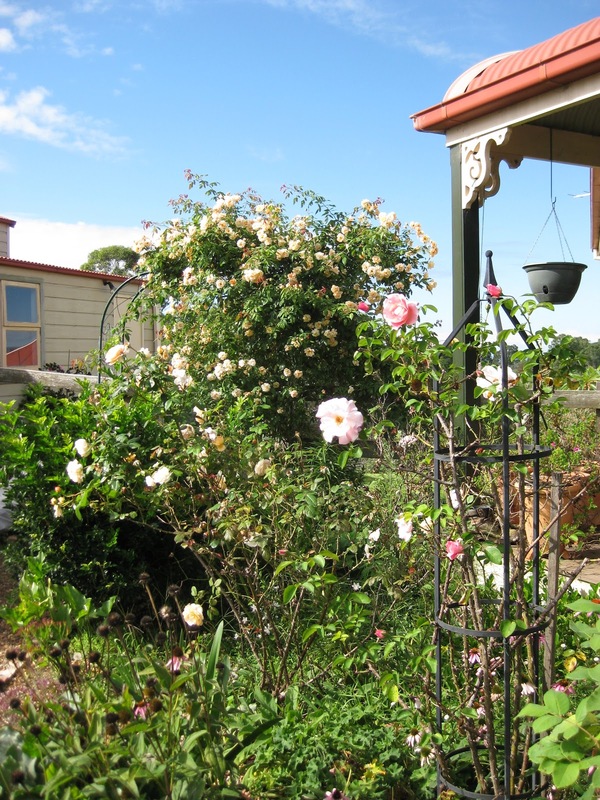 As I came back out the front door, she said "How come your roses are flowering so well when your garden is such a mess and uncared for?" OUCH!!! I must admit that they are all flowering well at the moment. All the rain we got came later this year than last and it seems to have suited them. Crepuscule on the archway at the side gate. The Icebergs outside the lounge room window. 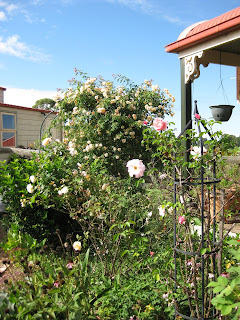 Here is the 'uncared for' western rose bed! You know, she's absolutely right!! Not really fond of wasps, but I can cope with the mud nest ones much better than the paper wasps which are evil critters with very foul tempers. Speaking of evil critters, Mike was using the whipper snipper on long grass near the western rose bed the weekend before last and saw something fly out from under the blade. It was another brown snake, only about 12 inches long, just a baby! I guess enough venom to kill a few hundred people or so. Rotten uncared for garden!!! And here's my last critter story for today! 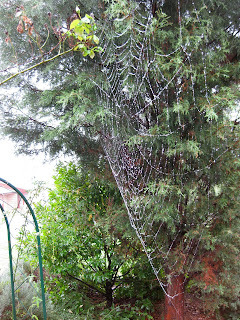 We have a number of Orb Weaving spiders in the garden at this time of the year - huge webs of the most sticky thread you could imagine. Lately, there's been a web hanging quite high above the ground on the western end of the house, between the window awnings and the guava tree. Yesterday evening, while talking on the phone, I happened to glance out the window and there hanging in the web was a baby flying fox! They are also one of my least favourite forms of wildlife but I had to rescue it. I used the long pole from the pool broom to break the web a few inches above where it's feet were entangled and here's a good indication of the strength of the web, I carried it suspended by the web all the way round the house, through the side gate and across the front to the wattle tree where I did my best to get it hanging from a reasonably sized branch. 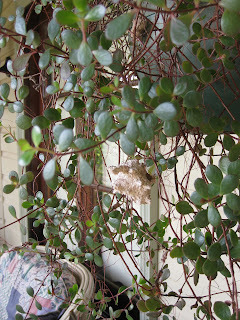 The web was still on it's feet so I kind of draped it across the wattle foliage. Got up this morning and went out to see if it was still there. 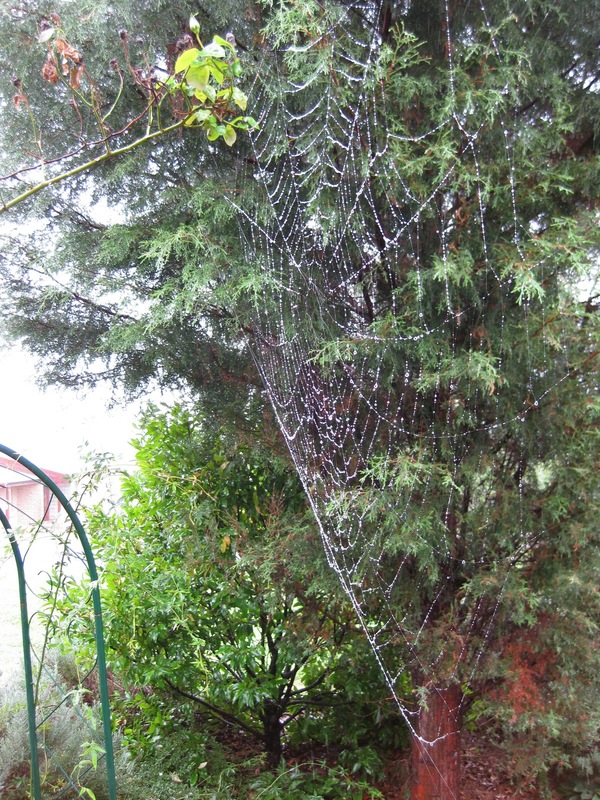 The web is still there but the little critter has gone. Maybe its mum came and picked it up. Maybe Grandpa, Grandma, Mum and Dad and all the other little brown snakes came and got it!! Good grief, I need to get out there and get working!! David Austin 'Charlotte' - again. Lovely rose! Oh boy, I don't need this . . . .
Catching up on the news . . .